By default WordPress allows readers to place comments under posts. Comments are a great way to interact with your readers and get feedback from them. Unfortunately, WordPress comments are constantly targeted by spammers. They use automated software to comment and place a link back to their page. Even unpopular WordPress blogs can receive thousands of spam comments. These comments can hurt your WordPress blog as they increase bandwidth and resource usage and can even negatively affect your search engine ranking position. This tutorial will show you how to setup WordPress anti-spam protection and stop spammers. The most popular plugin used to stop spam comments is Akismet. This plugin sends all comments to Akismet servers where they are checked using complex algorithms. If comments are considered as spam, Akismet will filter them out. Login to WordPress administrator area. Navigate to Installed Plugins section and press Activate button under Akismet plugin. You will see a big green success message. Press Activate your Akismet account button. API key is required for Akismet to work. Press Get your API key button in order to proceed. Alternatively, if you already have an API key, enter it into the field below and press Use this Key button. You’ll be redirected to official Akismet page. Hit Get An Akismet API Key button. In order to proceed, you’ll have to sign up for Akismet account. Enter your details and hit Sign Up button. 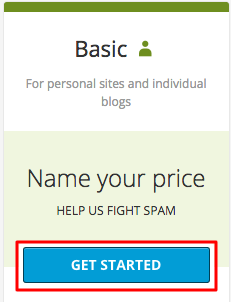 Unless you need advanced spam protection, choose Basic plan and press Get Started button. Use the slider at the left side and set price to $0/year, enter your contact info and press Continue button. You will be redirected to Akismet Account page. API key can be found on the top of the page. Press eye icon and copy your API key. 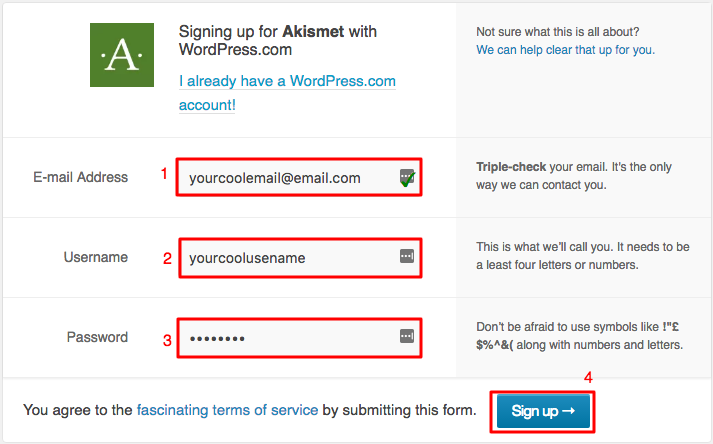 Head back to your WordPress admin area, open Akismet settings page and paste your API key. Press Use this key button. You will see a green message at the top of the page. Congratulations, you have just successfully installed Akismet plugin. Now all spam comments will be automatically placed in Spam Folder and deleted after 15 days. Access WordPress administrator area and navigate to Plugins section. Install WordPress ReCaptcha Integration plugin. You can find step by step guide how to install WordPress plugins here. Once the installation is complete, navigate to plugin’s Settings page. 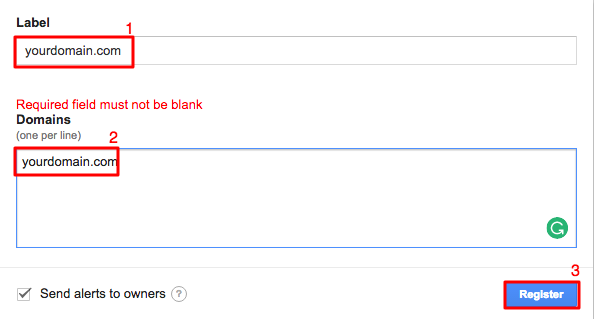 In order to setup ReCaptcha, you will need to obtain Site key and Secret key from Google. 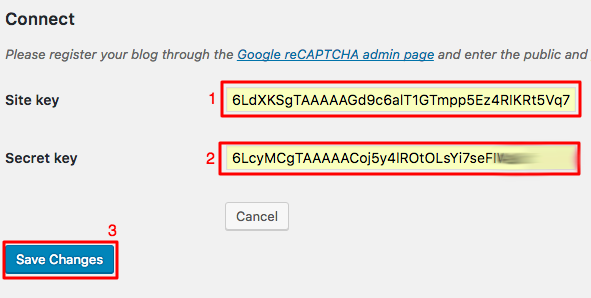 Press on Google reCAPTCHA admin page and you will be redirected to Google ReCaptcha admin page. Note that Google Account is required to enter this page. A new account can be created here. First of all, you need to register your blog. Enter your domain name in Label and Domains fields and hit Register button. New Site and Secret keys for your blog will be generated. Copy both keys and head back to ReCaptcha plugin’s settings page. Paste keys in appropriate fields and press Save Changes button. Now you should see more settings. Enable ReCaptcha for comments by pressing Comment Form button. At the bottom of the page press Save Settings button. That’s it! You successfully installed and enabled Google ReCaptcha. Now users will have to complete ReCaptcha challenge before submitting comments. Spam comments can harm your WordPress blog and even hosting account. They increase bandwidth and other resources usage, can negatively affect your search engine ranking position. By finishing this tutorial you learned how to protect your WordPress blog from spam comments.